to review the new National Standards for Marching Music. The National Standards for Marching Music, developed jointly by MENC: The National Association for Music Education and Drum Corps International, are nearing completion, and the public is invited to provide input into the process. Interested parties currently have one week left (until Monday, Nov. 1) to weigh in with their comments on the first-draft version of the proposed standards, which will have a far-reaching effect on the future of marching music education throughout the United States. 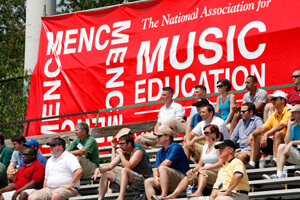 Under the guidance of a Blue Ribbon Panel comprised of designers, instructors, judge representatives and other experts in the field of marching music, these education standards have been developed to support teachers throughout the country in the overall alignment of their music programs with MENC's National Standards for Music Education. Drum Corps International has played a key role in developing the Marching Music Standards under the leadership of DCI Judge Education Director Gary Markham, who also acts as Judge Adminstrator for Bands of America and serves as Chairman of the Blue Ribbon Commission on National Standards for Marching Band. The standards are focused on three subcategories: Visual, Health and Safety, and Music. Individuals can post their comments under each section on the MENC website at MENC.org. Markham says that when providing feedback it is important to keep in mind that these standards are a set of guidelines and are not to be considered absolute measures of curriculum content. Marching music organizations determine the creative and pedagogical methods they will employ based on the unique needs of their students, as well as their individual goals and resources. "This was an important and critical step in providing meaningful guidelines for our highly visible activity," said Markham. After the conclusion of the 90-day public commenting period on Nov. 1, the comments will be reviewed, leading into the next phase of the project which will involve crafting the achievement standards to provide direction on how the content standards are applied. Learn more and post your comments on MENC.org.